It’s not uncommon to hear the well-travelled elite of Hong Kong moaning about the prices of Spanish food here. The complaints usually start off with the cost of tapas in the city (‘there’s an absolutely charming joint in Seville where tapas dishes are only a Euro each...’) but then you hear grumbles over the fact that Spanish restaurants in Hong Kong are frequently seen as being ‘too high-end’, whereas, back in the homeland, a pan of paella doesn’t need to be an extravagantly elegant affair. Yes, you can certainly make a convincing rebuttal in reference to the soaring rents in our city but you have to agree that we could do with a few more wallet-friendly Hispanic choices in town. So, there’s a new joint in the city that promises to be just that – wallet friendly. La Paloma, headed by Chef Willy. Hailing from Barcelona, Guillermo Trullas Moreno has made quite a name for himself in Shanghai. With nine restaurants under his belt and a string of accolades such as his flagship eatery El Willy being named the best restaurant of 2013 by City Weekend, he’s a celebrity in his own right. 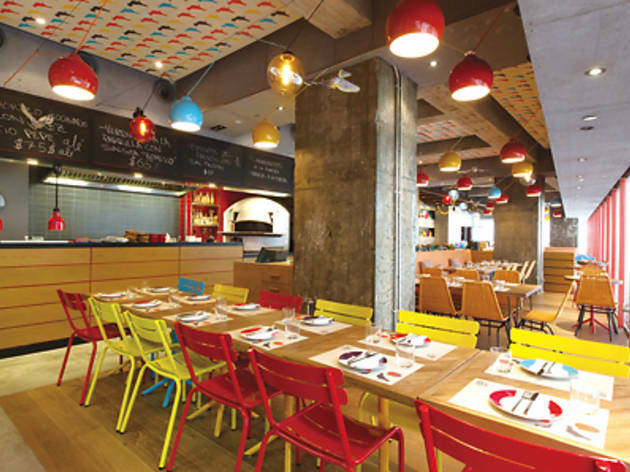 He hit Hong Kong in 2010 with his first offering here, FoFo by el Willy, and now finally follows up with La Paloma, his second city restaurant, which has just opened at new art complex Soho 189 in Sai Ying Pun. Named after the oldest nightclub in Barcelona and meaning ‘pigeon’ in Spanish, Paloma’s set to be the game-changer for Chef Willy. 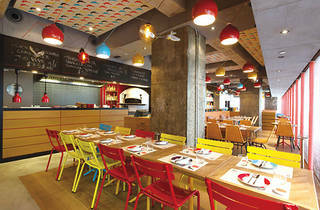 Occupying a 3,500sq ft space, the décor is colourful and dotted with pigeon imagery. There’s a half-open kitchen where you can see an authentic Asador – a Spanish clay oven – so we expect some fantastic roasts. There’s certainly a lot of tapas on the menu, so much so the dishes are separated into categories ranging from classics and tinned goods to soups and eggs. We start off with the tempting albóndigas (homemade meatballs, $68), the callos (braised tripe, $55) and the signature bacon con queso ($68). At first glance these prices are pleasantly affordable but tapas costs tend to creep up on you, so we make a note to reserve judgement until the final bill. The first dish to arrive is the bacon con quesos – and it’s a treat. Pillowy bite-sized pieces of bread wrapped in glistening ham give way to creamy cheese centres. Next up, the meatballs and tripe are served piping hot in small iron pots. The balls, immersed in a tangy tomato sauce, are flavourful – but we definitely prefer the tripe. Stewed with blood sausage and chorizo, the meat absorbs the flavours of each and is so tasty that we ask for more bread to mop up the sauce. It’s a winner. For something more substantial, we plump for la paloma (roast pigeon, $398) and arroz a la cazuela (a juicy seafood paella $328). The bird is cooked in the signature Asador oven and, boy, is it good. It’s tender and flavourful but the accompanying sauce and vegetables cooked with the meat are the real stars as they absorb the natural juices and marinade. This is a perfect example of simple cooking with good ingredients. Unfortunately the paella isn’t as good as we’d hoped, as the prawns are a little blackened on the edges – signifying that they’re not exactly fresh – and are bland in flavour. And the Ibérico pork in the rice would be better if it was seared beforehand to seal in more of the meat’s flavour. While this is by no means a bad dish, we’d like to see it improve in the future. So we hope our meal picks up again with the torrijas con vanilla (bread with vanilla ice cream, $58) dessert – and it does. Fluffy bread is soaked in vanilla sauce and then caramelised, leaving a layer of burned sugar on the top. Paired with the smooth ice cream, this dessert is fragrant and light.